The Ukutula Lodge & Conservation Center, popularly known as the “place of quiet”, is situated in lush green open area spread across 260 hectares where one can hear the roar of the lion literally for miles around. The Conservation Center is situated conveniently within an hour’s drive from Pretoria and Johannesburg. It comprises of unspoiled bushveld that boasts of innumerable wildlife species right from predator to antelope species, zebra, giraffe and much more. The Conservation Center is also home to over 130 species of birds. This is the place to be at if you wish to experience viewing wildlife kept in a conserved environment. Make your visit suitable to your interest, use Brits trip planner for personalization. You can enjoy a comfortable stay in the city by booking the best hotels in Brits like Klipplaatz Bush Lodge, Stirling Manor Boutique Guest House and Ukutula Lion Lodge. Explore the best Brits vacation packages that will take to you important landmarks of the city! For getting in, check out how to reach Brits. 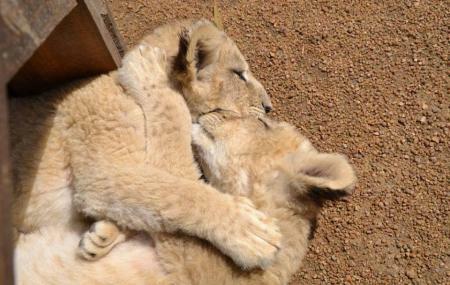 How popular is Ukutula Lion Park? People normally also visit Xstrata South Africa Pty Ltd while planning their trip to Ukutula Lion Park.